We have a combination of Mac and Windows machines in our house, and I was unable to get a new Windows 7 64-bit machine to print. The printer is shared using an Airport Extreme Base Station. I downloaded Bonjour for Windows and it immediately detected the printer. Everything seemed OK, but printing always failed. With those highlighted circles, it seems painfully obvious. But the “download” button is more prominent, so I didn’t read the text. Based on the number of people I encountered having the exact same problem, I must not be the only one to miss this. 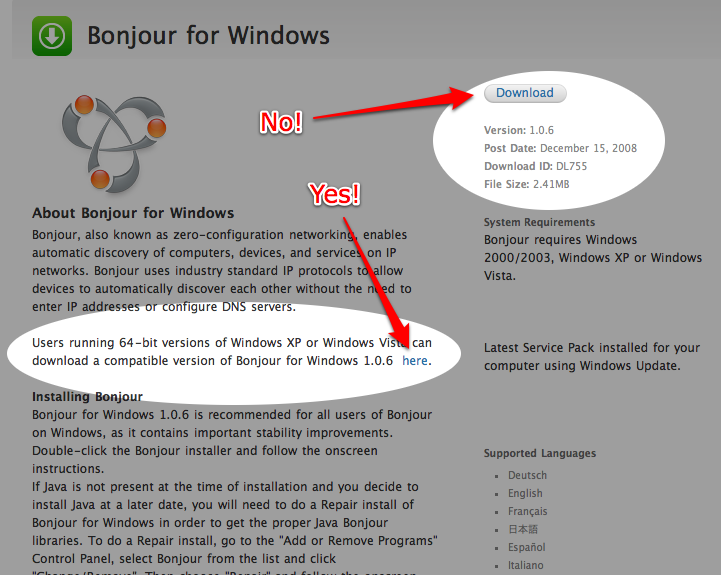 The real kicker is the fact that 32-bit Bonjour fails to warn you if you install it on a 64-bit PC. It happily finds the printer, leading to a false sense of success. One last tip — if Bonjour can’t find the driver, first plug the printer directly into your PC. Windows should be able to download the right driver. Posted on Saturday, February 6th, 2010 at 11:47 am in Apple, HOWTO, Microsoft.